How to BBQ pork ribs? There are tons of methods and combinations. 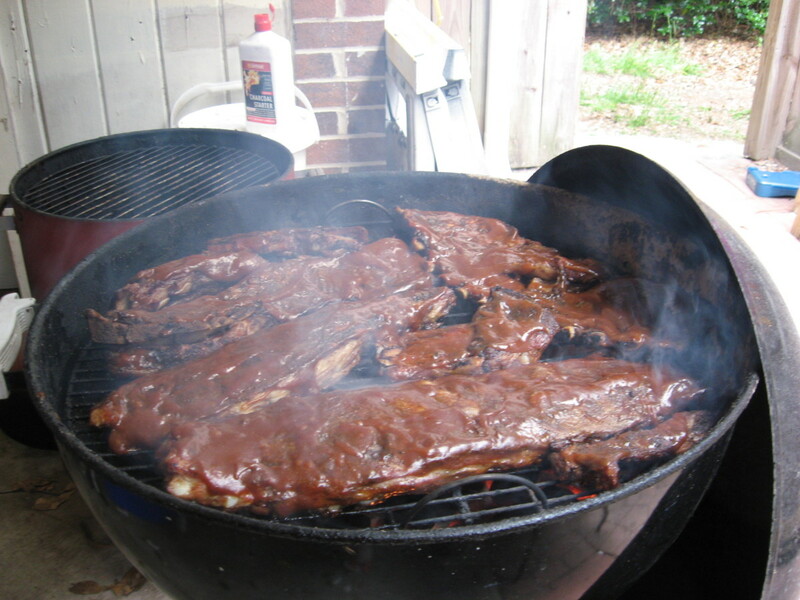 Some depend on what type of pork ribs you’re cooking or how much time you have to devote to the ribs. Of course, much of how to BBQ pork ribs is based solely on individual preference. 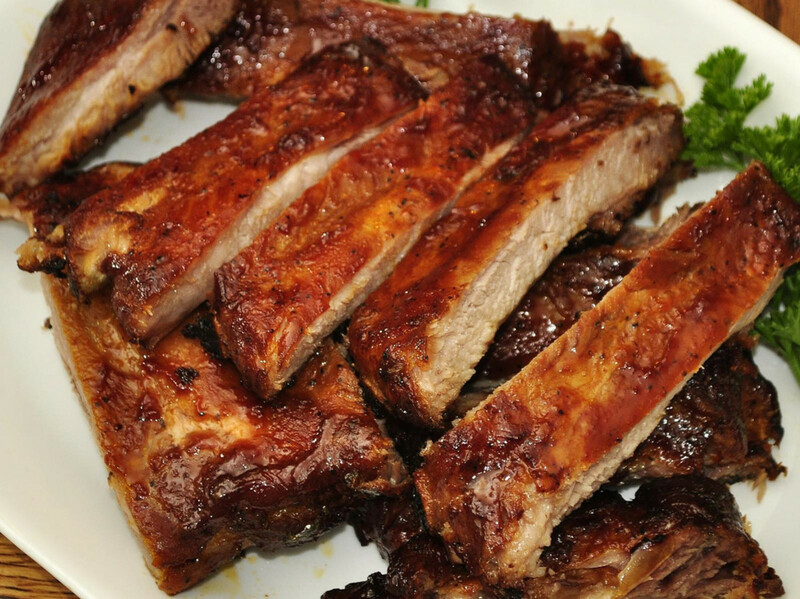 When it comes to types of pork ribs, basically, there are three: baby back ribs, spare ribs, and country ribs. I like baby back ribs and spare ribs much more than country style ribs, which aren’t actually ribs, anyway. 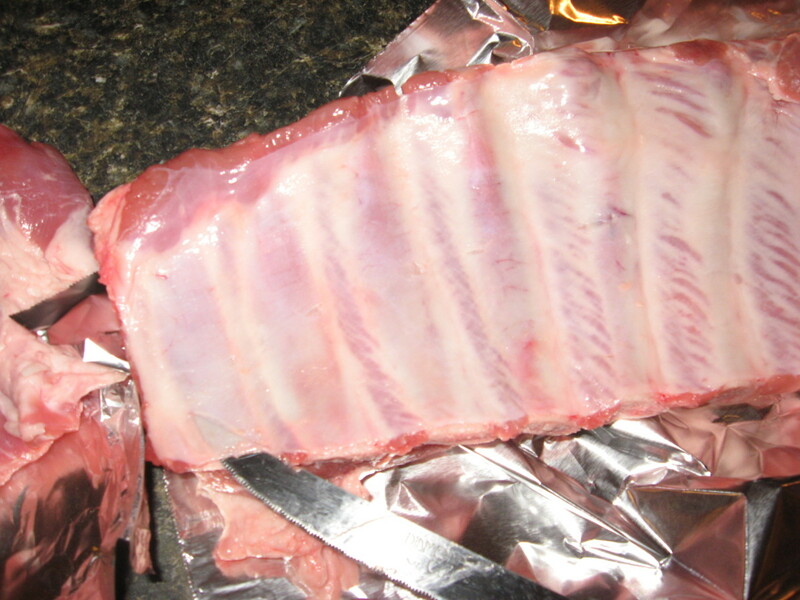 Baby back ribs are usually a little leaner and a little meatier than spare ribs, and the bones are smaller. Because they don’t have as much fat as spare ribs, baby back ribs usually cook a little faster than spare ribs. Spare ribs, however, have a cost advantage, as they’re usually cheaper. If you purchase a whole slab of spare ribs, you’re going to get some bony parts and “flaps” that you probably don’t want. For this BBQ spare ribs recipe, I used a St. Louis cut. 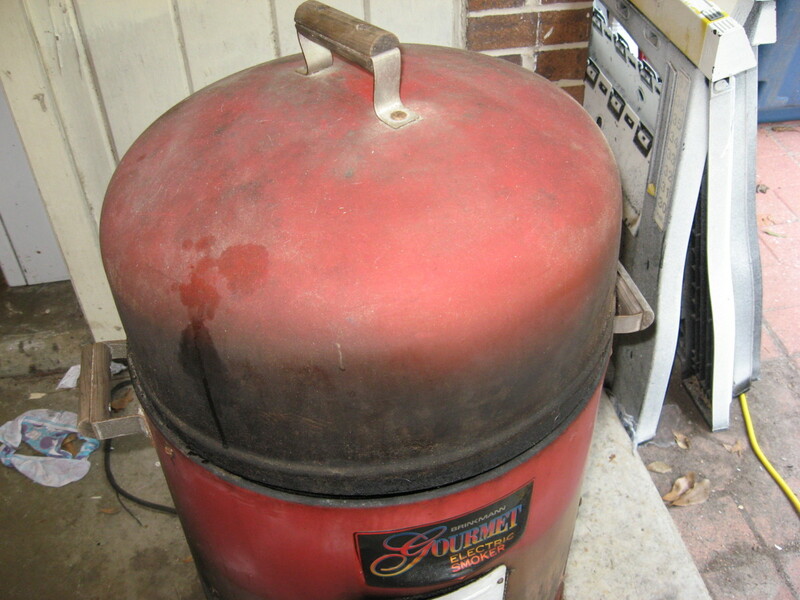 A recipe for BBQ ribs can be cooked on a BBQ smoker. This type of cooking has advantages and disadvantages. The good points are that the meat will be slow cooked, making it tender, with lots of smoky flavor. Another good thing about using a BBQ smoker is that the ribs won’t dry out because most smokers use moist heat, due to the water pan. Unfortunately, a BBQ smoker won’t give you the crunchy exterior on the ribs that so many folks enjoy. The barbecue sauce won’t be caramelized because the temperature in most smokers doesn’t get high enough for caramelization. Pork ribs on the grill also have their plusses and minuses. Grilling is a nice way to finish the ribs and caramelize the sauce, but to completely cook pork ribs on the grill will require some extra effort on your part. If you just throw a slab of ribs on a grill the way you would a steak, you won’t be happy with the results. They might not cook all the way through, and if they do, they’ll probably be very tough and dry. 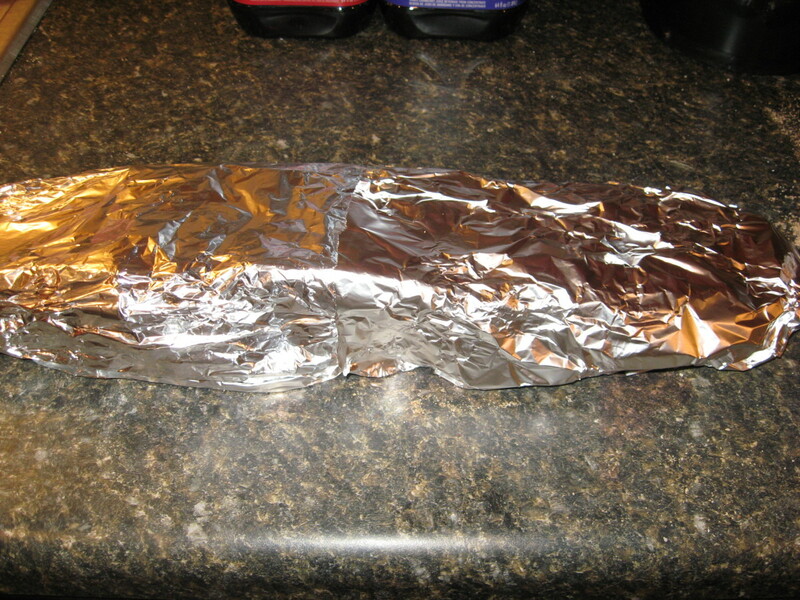 To do it properly, you’ll need to use indirect heat and maybe wrap the ribs in foil. You’ll also probably have to use a chimney with a charcoal grill. You’ll need a ready supply of hot coals to add to the grill because ribs will take a long time to cook. 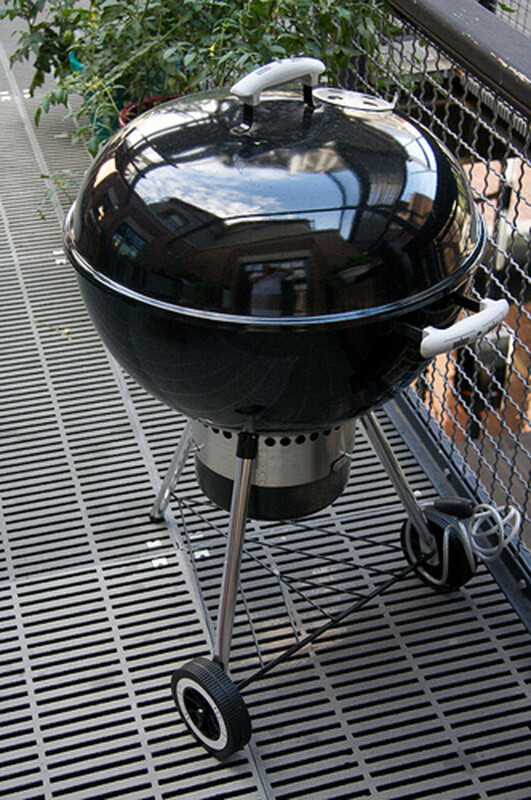 Gas BBQ grills are easy to use, and with many, the temperature can be easy to control. The problem here is that you’re not going to get smoky flavor without adding some wood chips. Even with a substantial amount of wood chips, I’ve never achieved as much smoke flavor on gas BBQ grills as I have on charcoal grills or with a BBQ smoker. I like our gas grill for cooking something quickly, but I’m not a big fan when it comes to a BBQ pork ribs recipe. I really like charcoal grills. To me, nothing matches the flavor of char-grilled meats that are nicely browned and a little crunchy on the outside. 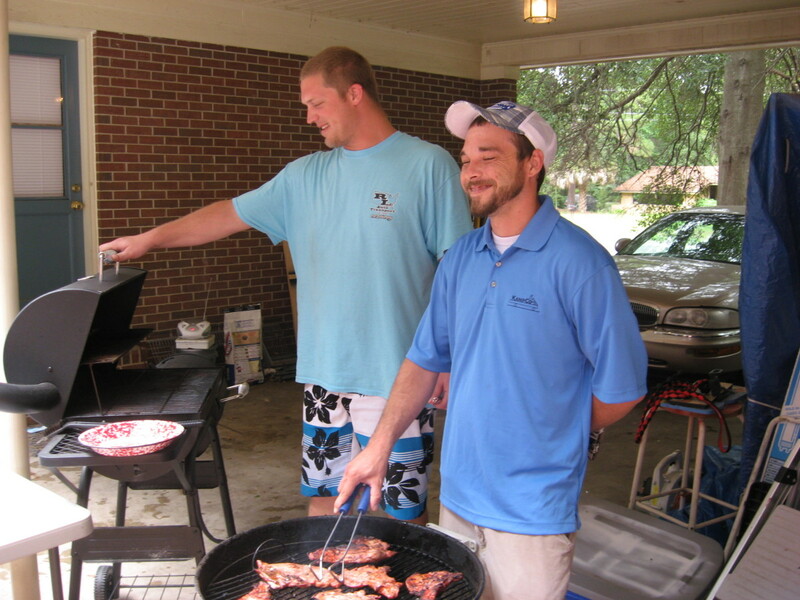 Our charcoal grills don’t have thermostats, so we have to control the heat when grilling ribs. That means using indirect heat. We build a fire on one side of the grill and place the meat on the other side. 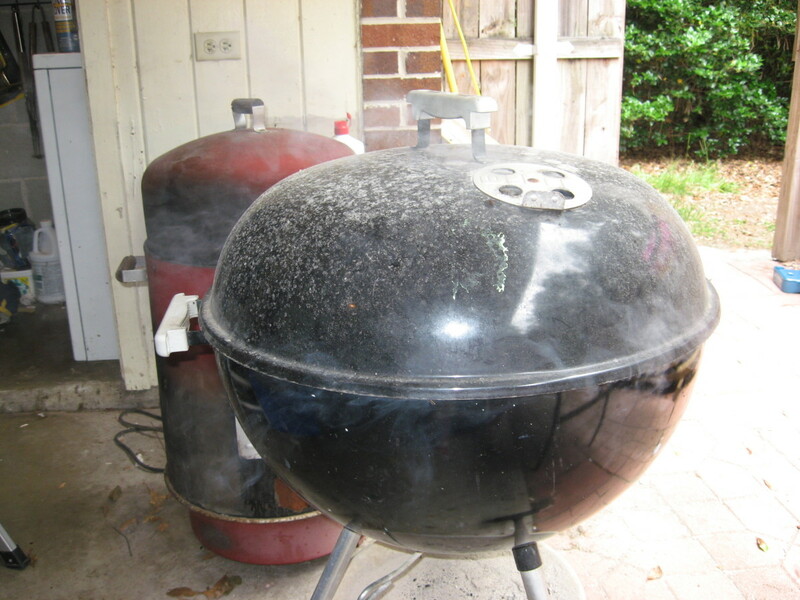 We ten close the lid and open the vents just enough to keep the coals burning. 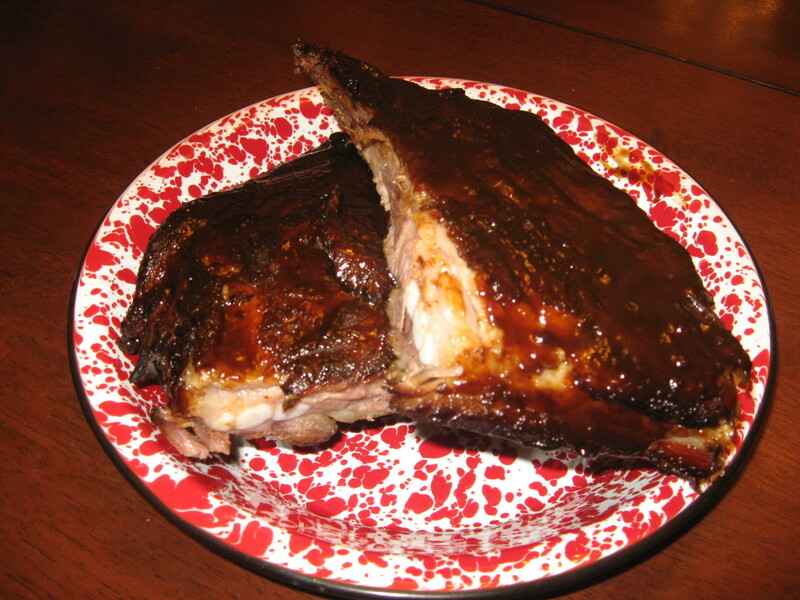 For this BBQ spare ribs recipe, I used my oven to cook the ribs first. Then I unwrapped them and used indirect heat on the grill to add some smoke flavor to the ribs. Next, I finished the ribs directly over the coals. If you want wood smoke flavor in your ribs, you’ll need some wood chips or wood chunks. Of course, you might be happy with just charcoal. 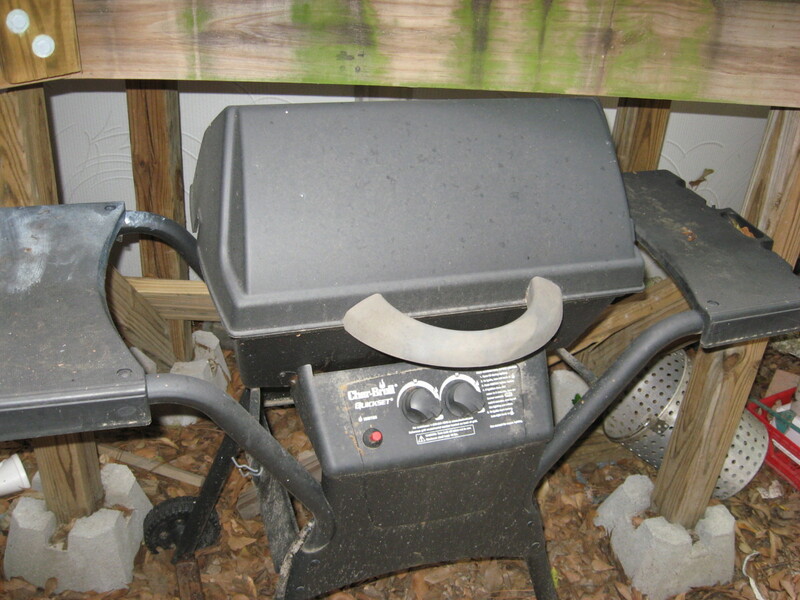 If you’re using gas BBQ grills, you’ll have to use some sort of BBQ woods, which is usually in the form of wood chips or wood chunks. Which flavors of BBQ woods go best with a BBQ pork ribs recipe? We like ribs with a sweet-hot sauce, so we like BBQ woods that compliment the sweetness. These include apple, cherry, peach, and other fruit woods. Hickory, oak, and pecan are also good for ribs. You might want to use more than one type of wood chips or wood chunks, or you might like adding some BBQ woods to your charcoal for a slightly different flavor. Just about every BBQ spare ribs recipe I use includes rib rubs. 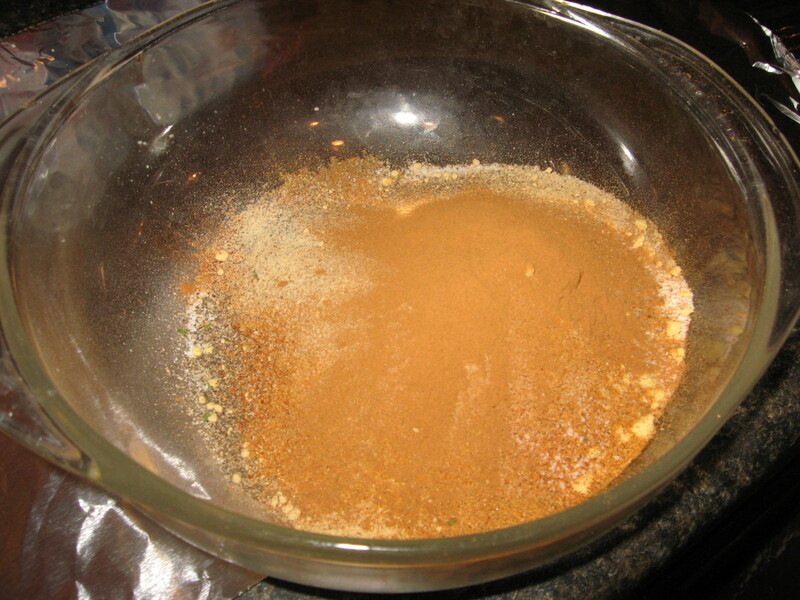 Most of my rib rubs include salt, brown sugar, spices, and herbs. For the BBQ pork ribs recipe I used today, I made an apple barbecue sauce, so I used flavors in my rub that would go well with the sauce. Speaking of sauce, I like to use a thick BBQ sauce that really clings to the ribs. The apple barbecue sauce I made for today’s ribs was sort of a cross between a sauce and a paste, actually. 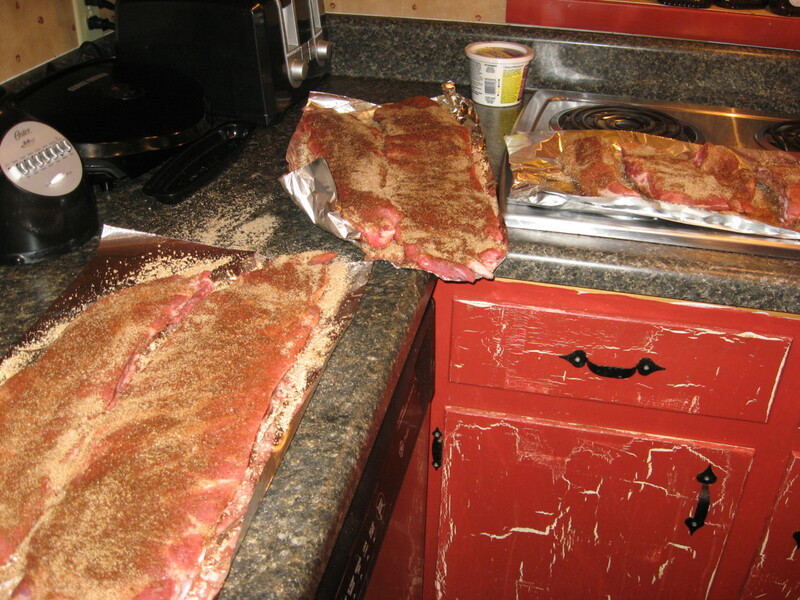 Another point about rib rubs – make plenty. Don’t be stingy with the amount of seasonings you use. I always pack on as much rib rubs as I possibly can, and I always make my own rubs. Of course, you can always buy commercial rubs, but rib rubs are easy to concoct yourself. Below, I’ve included the barbecue rub recipe that I used with my BBQ spare ribs recipe. Directions: Combine ingredients well. If you’re cooking a lot of ribs, you’ll want to double or triple this barbecue rub recipe. If you have any left, store it in a cool, dry place, in an airtight container. Try it on chicken and other cuts of pork, too! 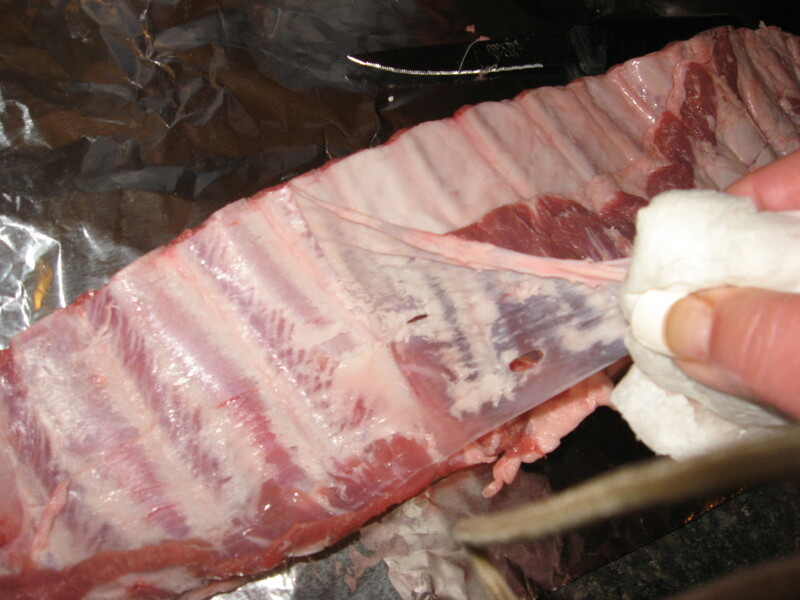 Trim your ribs of fat and remove the fell. The fell, or “silver skin,” is the tough fascia that covers the bony side of the ribs. Removing the fell will allow more of the rub to get into the meat. Doing so will also make the ribs more palatable. To remove the fell, insert a knife under the membrane. When you have a corner pried up, grab it with a dry paper towel and peel the skin back. 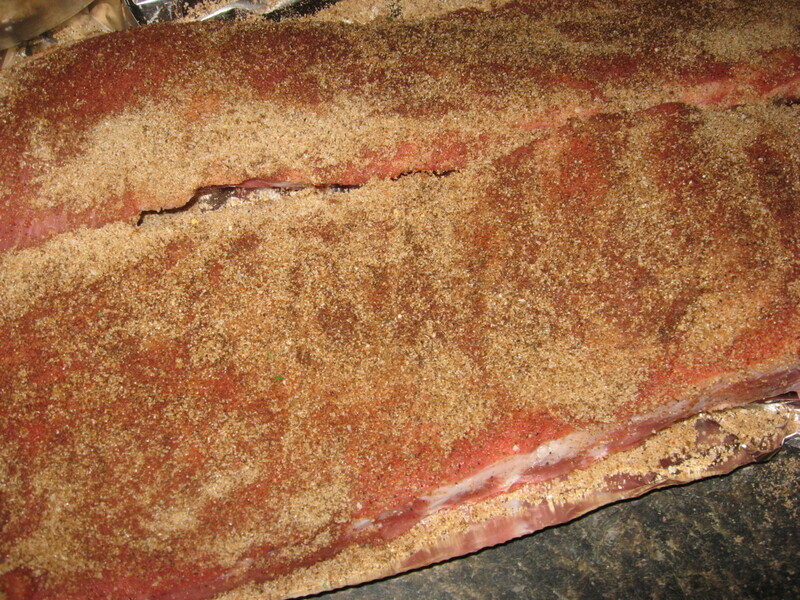 When the fell has been pulled off, apply my barbecue rub recipe – generously – to both sides of the ribs. 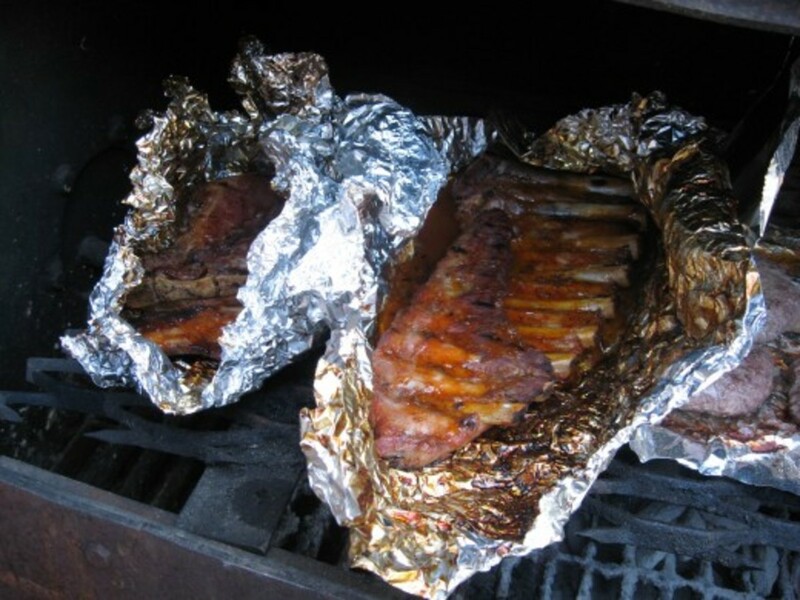 I place the ribs on a large sheet of foil to do this. When the ribs have as much rub as they’ll hold, I wrap up the slabs in foil and refrigerate them overnight. 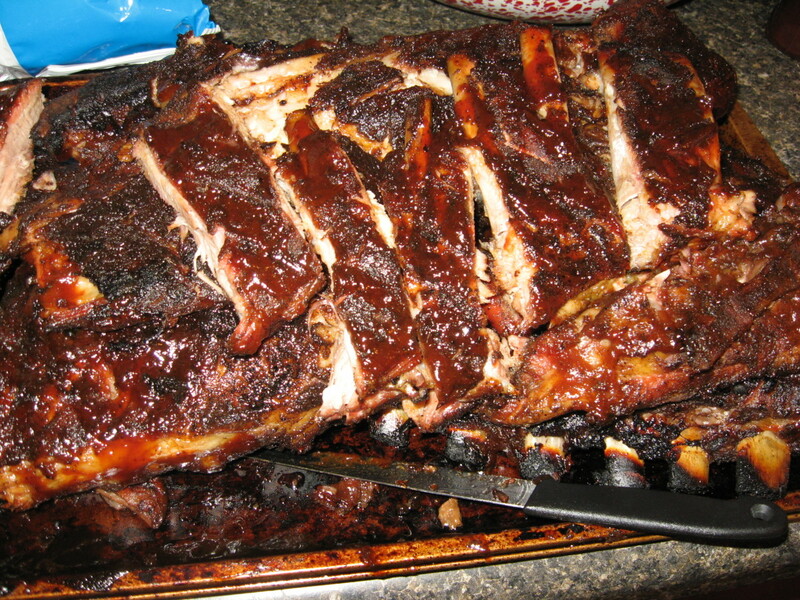 After the rubbed ribs have spent several hours in the fridge, preheat your oven to 325 degrees. 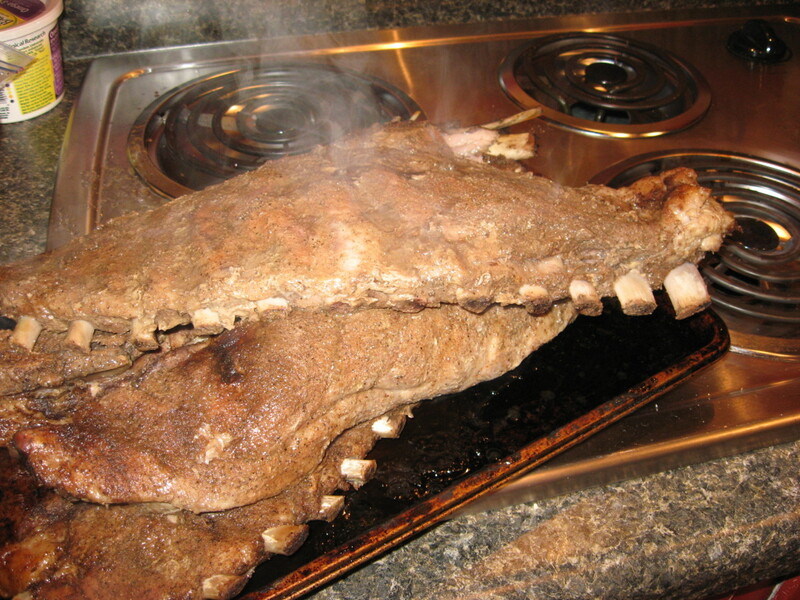 Place the wrapped ribs on a cookie sheet or shallow baking pan and cook the ribs for two and one-half hours. While the ribs are cooking, get your grill ready. I like charcoal grills best for this. 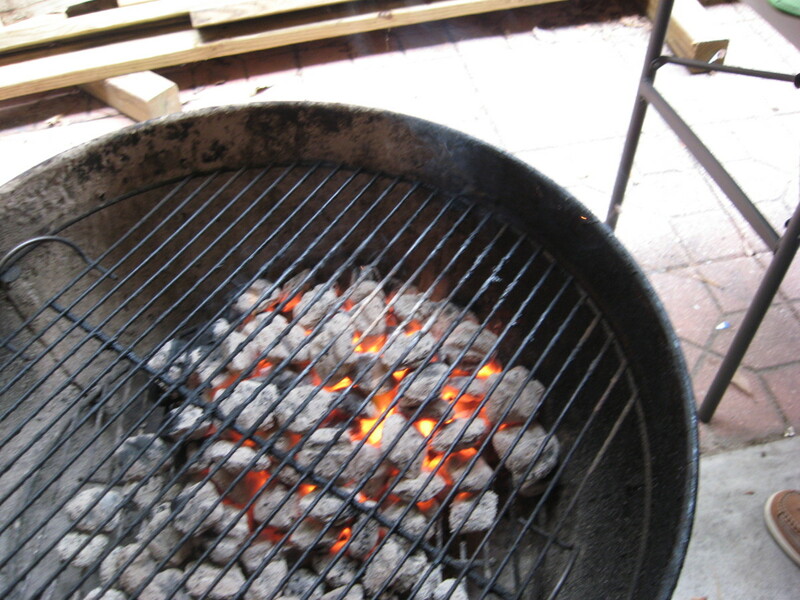 Place the coals on one side of the grill, and add wood chips or chunks, if desired. When the coals are ready, unwrap the ribs and place them on the opposite side from the charcoal. Close the lid and smoke the ribs for one hour. Remove the ribs from the grill. I use tongs and a spatula for this. Next, scatter the charcoal evenly. Return the meat to the grill and brush the top side of the ribs with sauce. Cook for about ten minutes, with the grill lid off. Flip the ribs over and apply sauce to this side. When the sauce on the bottom side has browned nicely, flip the ribs again. Apply more sauce, if you wish. When the sauce on the bottom side has caramelized, remove the ribs and cover them tightly with foil. Let the ribs rest for fifteen minutes before serving. If you wish, cut the ribs into individual pieces. 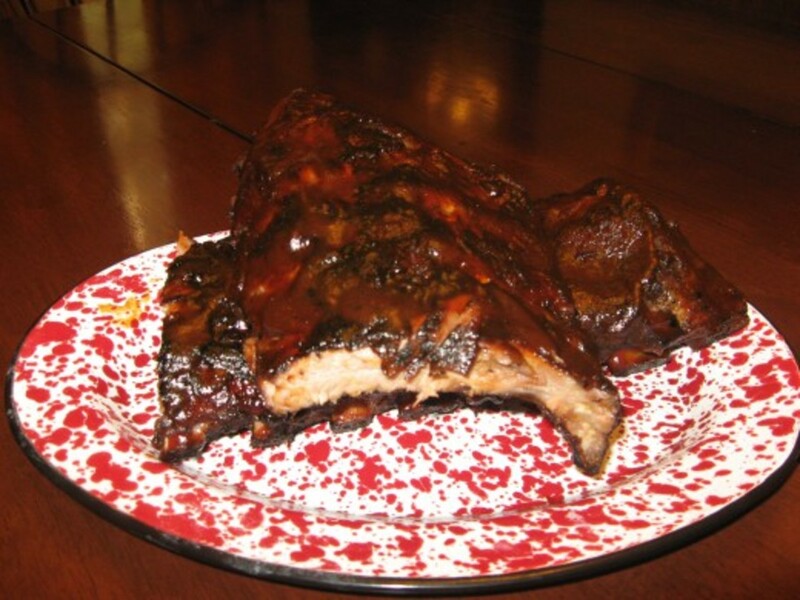 My BBQ Spare Ribs Recipe – Easier Than It Sounds! I hope you’ll try my recipe for BBQ ribs! This also works for baby back ribs, although you might want to decrease the time in the oven to about two hours. I haven’t tried it with country-style ribs or with beef ribs, however. The pork ribs turned out beautifully, and they were a big hit with our guests. The ribs were almost to the fall-off-the-bone point, but not quite. They held together nicely and had a wonderful texture. We could also taste the hints of spices from the rub, and the apple-flavored sauce was incredible. And, by the way, even total beginners will have success with this process. This BBQ spare ribs recipe is much easier than it sounds – really! 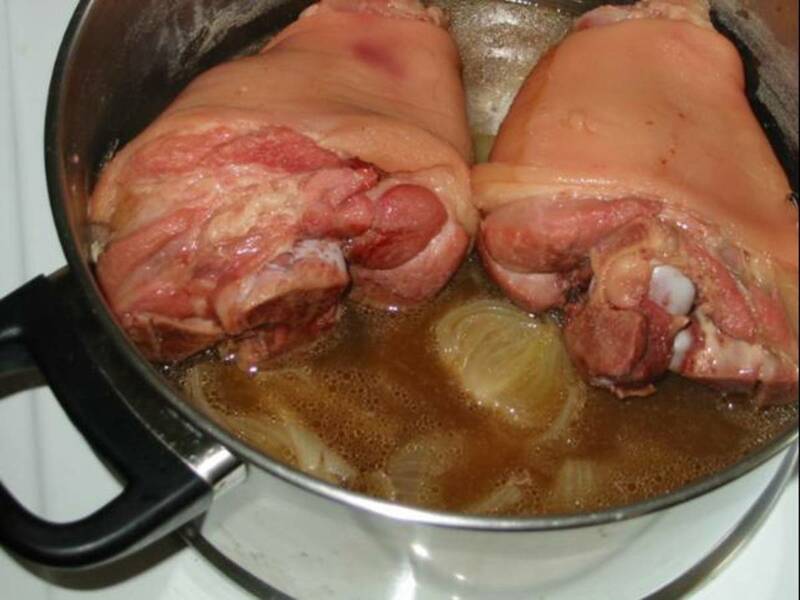 A step-by-step guide for a great pulled pork recipe. Photos and videos included. Great info about BBQ rubs - rib rubs, pork rubs, chicken rubs, turkey rub, and steak rub. BBQ rubs recipes, photos, and helpful videos included. How to smoke a turkey. This is perhaps the best smoked turkey you'll ever eat! At first glance, the first photo loekod like the sheep was standing on the back of the goat. It made me do a double look. Great photos.I like how use captured the intensity of the colors in the last photo. There is a lot going on in the photo, so it draws me in looking at all the items.Well done. Nice job. I've used the exact method as you many times and it does work well. I alayws run into the same issue though when wrapping the ribs and adding apple juice. Even though I use heavy duty foil it is very easy to developed leaks where ever the foil kinks as you wrap them. This lead me to eliminating that step and just letting them cook for 5 hours uncovered followed by the 1 hr with sauce on them. I really couldn't tell any difference that the wrapping/apple juice step added. This is such a comprehensive hub! Thanks for all of the great information. I love the dueling grills picture. Those look like nice ribs! Bet everyone truly enjoyed them! Voted up! I think my mouth is watering now.